Yunus Topal achieved his childhood dream of traveling to the poles with his latest trip to the South Pole. There is nothing you can't do if you set your mind to it, and Yunus Topal may be the best example of this statement. Topal, an academician at Hacı Bayram Veli University, is the first Turkish explorer who has traveled to both the North and South poles. 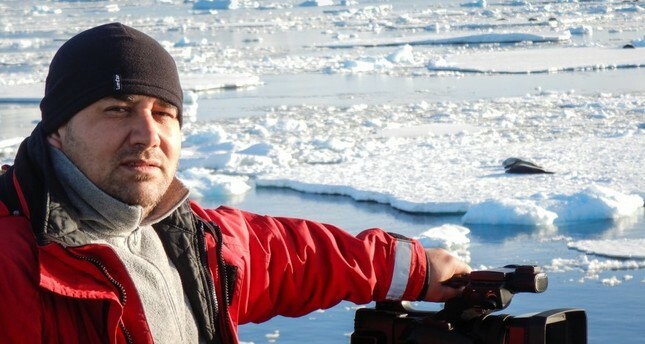 He has also filmed the first ever Turkish documentary on Antarctica. However, his mission was not an easy one. Topal had a tough childhood. He grew up in child protection institutes without a family. He studied hard to be the best in his class and filled long nights with his books, dreaming about the life of the explorers he read in adventure novels. While his peers were seeing new places and traveling to countries that he could only visit through the pages of books and magazines, Topal set his mind on one thing: He was going to travel to the furthermost point of the plant, in other words, to the end of the world. 1"I have always been fond of adventure and faraway places because I do not have a sense of belonging. For me, I have everything and all the places on earth belong to me. I have traveled to 40 different parts of the world and during these trips; I decided to go to the end of the world; to the poles. I did not have a certain mission in mind at first. I had to go there and touch the ice once in my life. I was dreaming of walking on the poles," said Topal. The North and South poles are the most unreachable places on Earth. It is only in certain periods that 150 people are allowed to travel to both ends of the world. However, getting a ticket to the poles is not the only step. Before the trip, explorers have to pass medical tests and prove that they can survive in the most inhabitable conditions in the world. On the other hand, the travel is so costly that you either have to be rich or find a willing sponsor. Topal's first trip to the North Pole was in 2014. As he was not able to find a sponsor, he had to take a loan from the bank to cover his travel expenses as well as the equipment he purchased. However, he managed to find a sponsor for his adventures as well as the documentary he filmed in Antarctica, the South Pole, and covered his expenses with the sponsorship money. Before heading to the poles, Topal went through a serious series of preparations both physically and mentally. "You have to be in good physical condition and be prepared for the worst because you have to cope with the cold and blizzards that you have never come across before. To be ready for the task ahead, I trained on getting used to the cold and trained every day to be fit for the physical requirements of the pole expeditions," said Topal. Also before heading to the poles, one has to go through a series of medical tests in order to prevent any health problems that can occur during the expedition. "You might have to have appendicitis and have surgery for it to be removed. You might also experience dizziness and severe headache as the air in the poles is the cleanest and purest in the world. It takes time for your body to get used to it," Topal added. The physical preparation for the expedition is hard but it is nothing compared to how mentally prepared one should be. Once you set foot on the poles, there is nothing and nobody for thousands of kilometers except for the expedition team you are with. During his trip to the South Pole, Topal and nine other explorers walked for hours and slept only for a few hours a day during their two-month adventure. "The sense of loneliness and solitude might cause a psychological break. While the climate conditions are hard on your body, they are also hard on your mental health but there is no going back. You cannot give up. You have to travel until the end, carrying tens of kilograms of weight on your back and return leaving nothing but your footprints on the snow," added Topal, speaking of the mental challenges of the south pole expedition. Once Topal was ready for his last target, the South Pole, last year, the only thing left was to set off but of course reaching the poles is another story. Topal traveled for 45 hours by air in order to get to the place where had to take a ship to reach his destination. The explorers travel for their final destination on special ships which are able to break the ice on their way. Topal said it is also important to be in sync with fellow explorers in the team. "You have to get along with your team mates to have a sturdy mental condition. If you are in a bad situation, your teammates are the ones that will help you. You cannot say you give up and return." During his journey to the South Pole, Topal filmed the first every Turkish documentary on Antarctica. Written and directed by Topal, the documentary, which will hit theaters soon, is in four languages and aims to raise awareness on global warming and its effects on the habitat in Antarctica. "Global warming is a huge problem for the future of our planet as well as humanity. We have to protect planet Earth and come up with individual and institutional policies to prevent global climate change. Carbon emission should be stopped and fossil fuel consumption should be limited as soon as possible. From cosmetics to transportation, all industries should review their corporate structure and update it," said Topal. He further stated that global climate change threatens all living beings on the planet and its effects can lead to storms and other natural disasters which can cause billions of dollars of damage around the world. "Global warming and the disasters it causes in not only cities, but also on agricultural areas, threaten our resources. In the future, mankind might not be able to have enough food to sustain them and live properly, as the world will become more and more inhabitable. In the next 30 years, we might witness reverse migration," Topal added.